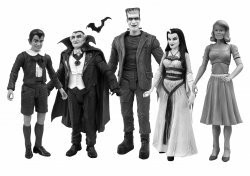 This HO-scale model kit features the home at 1313 Mockingbird Lane of the favorite TV Family of Fright, The Munsters. 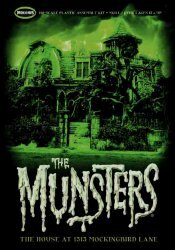 For the first time ever, the Munster's House is recreated as a styrene kit! Based on the classic Munster's TV series, this kit is done in HO scale and is perfectly sized for train layouts. This large kit is Skill Level 3, recommended for modelers ages 15 and up. Photos show box art and sample buildup professionally constructed and painted. Paint and glue/cement not included. Completed house stands about 6 inches tall. Collectors Note: Brand-new, factory sealed thin-walled boxes are tightly shrinkwrapped and may have a crimped edge or two from the manufacturer. Moebius did not intend for the box to be a collectible.